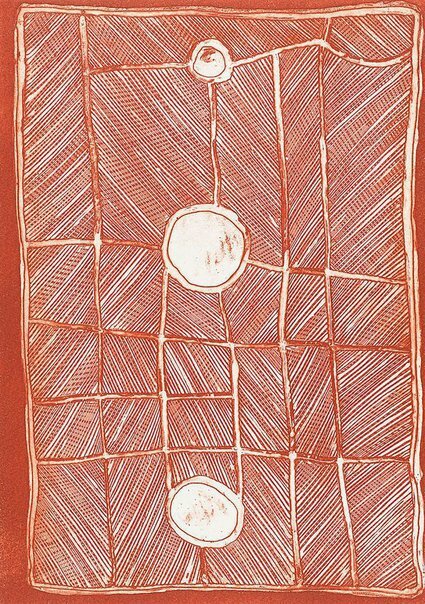 'Mardayin ceremonial design' 2003 by John Mawurndjul concerns a major patrimoiety ceremony of a secret and sacred nature called Mardayin. Much of the meaning of the iconography in the image is not in the domain of public knowledge and so it cannot be explained here in detail. The print refer to a site at Mumeka, an outstation in the artist's clan estate in the Mann River region. The Mardayin ceremony performance site is located on a large billabong covered in waterlilies. This place is about 50 km south of Maningrida in Central Arnhem Land. Since the 1980s John Mawurndjul has gradually moved from painting figurative representations of such spiritual entities as Ngalyod the Rainbow Serpent and the mermaid-like female spirits or yawkyawks, to dazzling abstract patterning that completely covers the bark. These 'abstract' bark paintings represent body painting for the Mardayin ceremonies and relate to sites near his homeland at Mumeka. There is also a connection with the dazzling optical effects associated with the skin of the rainbow serpent. 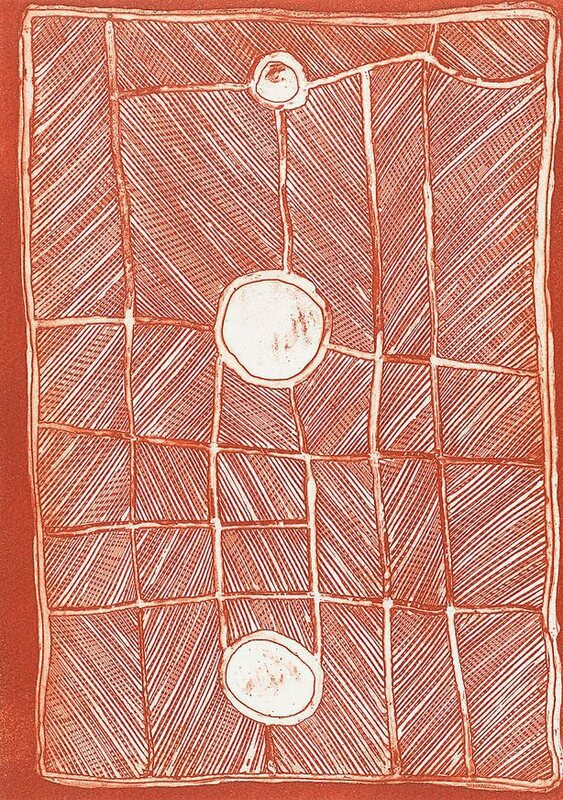 The etching 'Mardayin Ceremonial Design' 2003 exemplifies Mawundjurl's transition from figurative works to abstraction. It is significant that there are etchings by both Mawurndjul and his wife Kay Lindjuwanga as this reflects the partnership that he has developed with her (and his daughter) who have been instructed in painting cross-hatching so that they can help him with his bark painting. This collaborative approach to painting is not unusual wirh Aboriginal artists. Kay Lindjuwanga now paints bark paintings under her own name as well as continuing to help her husband. Mawurndjul is arguably the finest bark painter working at the moment. He is particularly noted for his fine rarrk (cross-hatching). Mawurndjul was tutored by his brother Jimmy Njiminjuma (b.1945) and uncle, Peter (Djakku) Marralwanga (c.1916-1987), both superb artists. John Mawurndjul has had solo exhibitions at Gallery Gabrielle Pizzi in Melbourne since 1991. He regularly shows at Annandale Galleries in Sydney and his work is in many public and private collections in Australia and overseas. Mawurndjul has won several prizes including the 1999 and 2002 Telstra Bark Painting Award at the National Aboriginal and Torres Strait Islander Art Award held by the Museums and Art Galleries of the Northern Territory and the 2003 Clemenger Contemporary Art Award at the National Gallery of Victoria. Crossing country: the alchemy of western Arnhem Land art , Sydney, 2004, 152 (colour illus. ), 226.